Showing His Inner Trickster - Robert Downey Jr. Hilariously Trolls Tom Hiddleston! Avengers co-star Robert Downey Jr. is famous for his red carpet ribaldry; the latest victim of his trolling was Tom Hiddleston. You mad bro? In the Marvel Cinematic Universe, the God of Mischief may be played by fan favorite Tom Hiddleston, but if he held the title in real life, he’d be getting a run for his money! His Avengers co-star Robert Downey Jr. is famous for his red carpet ribaldry; and now he has now taken it to another level. Many fans might criticize Marvel’s movies for being too jokey and child-friendly; however, that doesn’t stop the stars from having a good old time. From press-tour pranks to on-set silliness, it seems like the cast have a genuine affection for each other and, like the crews of Harry Potter and The Lord of the Rings, they have developed jokey familial bonds. Tom Hiddleston recently joined Instagram, and the beloved Brit used his first post to announce Loki’s emphatic return to the onscreen universe, with the caption "He's back!" But Iron Man himself clearly couldn’t stand not being in the limelight, nor resist making a joke about Hiddleston’s high-profile relationship with Taylor Swift. It must have taken a bit of digging through the many thousands of photographs, but Robert Downey Jr. finally found a juicy snap of a particularly ripped Hiddleston, and upon welcoming his fellow actor onto the social media site, he - well check it out for yourself! Haha! Oh Robert...carry on like this and people say that you truly are Tony Stark-more than they do already! Joke's on You, Iron Man! Should we be surprised though? Jokes of this kind are not unheard of from Robert Downey Jr, since he is a well-established presence online and is known to have frequent fun with his fans on his Facebook, Twitter and Instagram pages. Hiddleston hasn’t yet responded, so it’s best to keep an eye out in case he does – knowing him, his riposte is bound to be clever and classy. However he may not have time- he is currently in Australia, busily shooting Thor: Ragnarok with Chris Hemsworth, after all. Could we expect a sneaky Iron Man cameo? Probably not, since Thor: Ragnarok is hinted to be traversing the far-flung reaches of the Nine Realms, and last time Stark took a trip into space in the first Avengers, he didn’t fare very well. 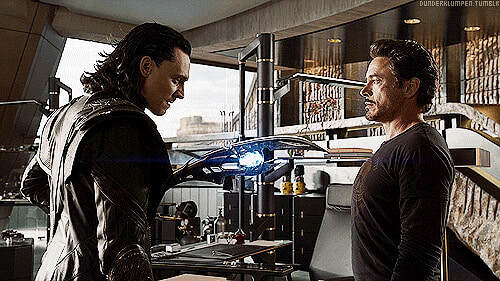 Nevertheless, it would be very interesting to see Robert Downey Jr’s Tony Stark come face-to-face with Tom Hiddleston’s Loki once again. Indeed, Downey Jr. cryptically shared this fan-made poster recently, hinting not only at a major cast reunion for the upcoming Avengers: Infinity War, but also a crossover with the Netflix characters, to the excitement of many fans. Some people were quick to point out that it was outdated, since it featured the now-discontinued Parts 1 and 2 titles. However, it still remains an intriguing prospect. Has Downey Jr simply made a mistake? Is he trolling...or is there some truth to it? Iron Man v Loki... Round 2? Either way, I think we can all agree that we would love to see these two talented chaps together again. Though they might be friends off-screen, to say that their characters don’t get along would be an understatement. As we saw in Captain America: Civil War, and even in Avengers: Age of Ultron and Iron Man 3, Stark has still got a lot of hang-ups about the traumatic Battle of New York, and the lives he has since failed to save; like the God of Thunder, I doubt Iron Man would be too pleased to discover that Loki is still causing mischief in Asgard. Would they have a bit of a showdown before teaming up to fight Thanos? It’s still too early to say, but I’m sure that the rest of Phase 3 will deliver, and these brilliantly-cast actors will continue to dole out the fun to the fans! Swing To The Top Of The Class — 'Spider-Man: Homecoming' Has A Spectacular Opening Weekend!